Miami is the cruise gateway to the Caribbean and Mexico. But the city at the base of Florida is a destination in its own right. 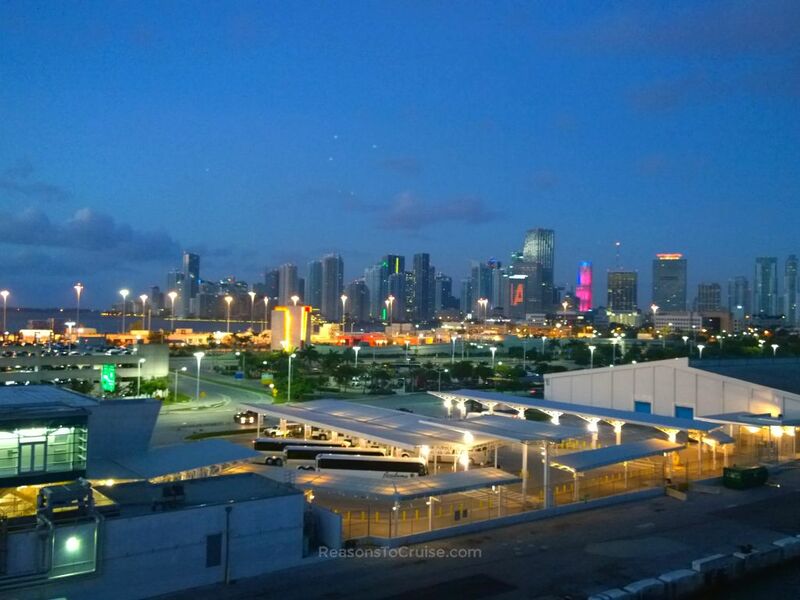 I landed in Miami one day ahead of my Carnival Breeze family cruise to the Caribbean and only had a very short amount of time to explore the city. With this in mind, here are my top tips for getting the most out of your limited time in Miami if you are taking a family cruise holiday. It can be very tempting to book a cheap hotel on the outskirts of the city but doing so means you will miss out on the action. 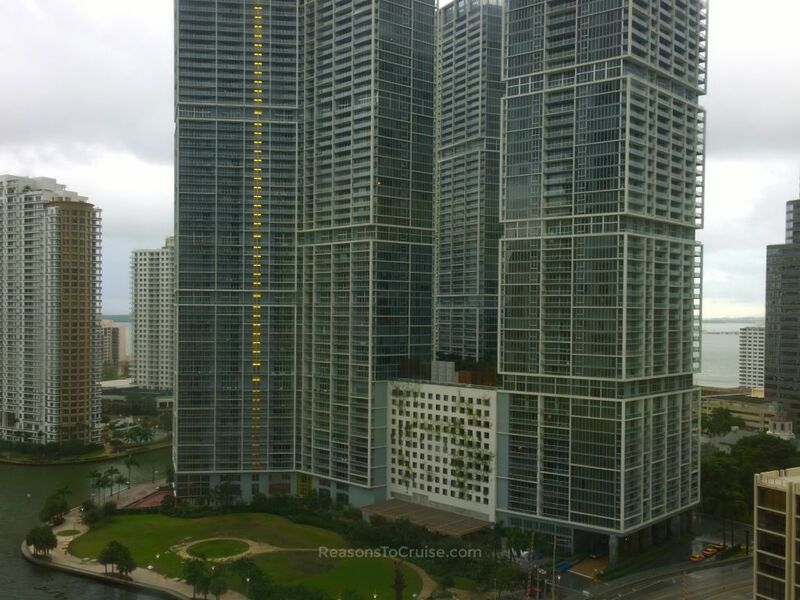 I stayed at the Hyatt Regency Hotel in Downtown Miami. Its central location meant I was extremely close to restaurants, the waterfront, and to a Metromover station - all very handy when you have kids in tow. I requested a room on a high floor and from this had a great view over the surrounding area. I could just about glimpse the sea behind one of the nearby tower blocks. For stunning waterfront views consider the InterContinental hotel on the waterfront as it would surely offer magnificent views from its sea-view rooms. I requested late checkout meaning I checked out and headed straight to the cruise port without needing to hang around. I also had the morning available to explore Downtown - an impossible task had I stayed further afield. I crammed in as much exploration time as we could but only just scratched the surface of Miami. Most transatlantic flights will force you into booking a one-night hotel stay before your cruise thanks to travel times. The city deserves at least an extra couple of days tagged onto your cruise holiday. For a relaxing start and end to your Miami cruise, book a hotel stay for at least one night before and one night after your sea travels. I used hoppa.com to pre-book my transfer from Miami International Airport. Including the driver's tip, the service cost around £20. A taxi transfer, by comparison, would have cost around $40 (&thickapprox; £31), depending on traffic. A friendly lady holding a personalised sign met me in the Arrivals hall. She escorted me outside to a kerbside kiosk and gave me the number of my taxi to look out for. It transpired I had been booked onto a SuperShuttle service, a highly reputable transfer service I have used before in New York City. Had I booked with them directly, I would have paid around $42 (&thickapprox; £33) plus taxes so booking with hoppa was a very smart move. Shared transfers come with a risk of being the last party to be dropped off at the hotel, but good fortune meant I was first. Take into account the length of time it is likely to take you to clear US Customs and Immigration when choosing your transfer pick-up time. I added an extra hour but should have opted for an additional 90-minutes. Florida state law required my two-year-old to sit in an approved car seat. Some transfer companies offered to supply a car seat, albeit at an exorbitant fee. The cheapest airport-to-hotel transfer I found including a car seat was $100 (&thickapprox; £77). The three-mile journey between the hotel to cruise port came in it at the same eye-watering price. Instead, I purchased a cheap car seat from Argos before I flew out. British Airways carried this in the hold for free and handled it with great care - no knocks, bumps or scratches. Buy a cheap car seat specifically for travelling. While the car seat survived the flights, it took a heavy battering when offloaded from the cruise ship at Miami. Deep gouges and tears in the fabric (despite being bagged up) suggest rough treatment somewhere along the line. Florida State law exempts journeys made by coach or bus, but juggling an infant and luggage on public transport sounds like a perfect storm. I disembarked the cruise ship by 9 am. My flight departed at 5 pm, leaving plenty of time to keep a two-year-old happy. I had read mixed reviews of sightseeing airport transfer excursions and was hesitant to book them. I finally opted for the South Beach trip booked directly through Carnival Cruise Line, priced at $50 (&thickapprox; £39) per adult (infants and toddlers were free). I boarded the coach at the cruise terminal before it headed to South Beach. The coach was also being used for a "Top Sights of Miami" tour so after it dropped off South Beach passengers it continued on the sightseeing tour. It returned a couple of hours later to pick up the remaining passengers before proceeding onto Miami International Airport (MIA) and then Fort Lauderdale–Hollywood International Airport (FLL). It was a convenient service and the fact my luggage was taken care of was a real bonus. 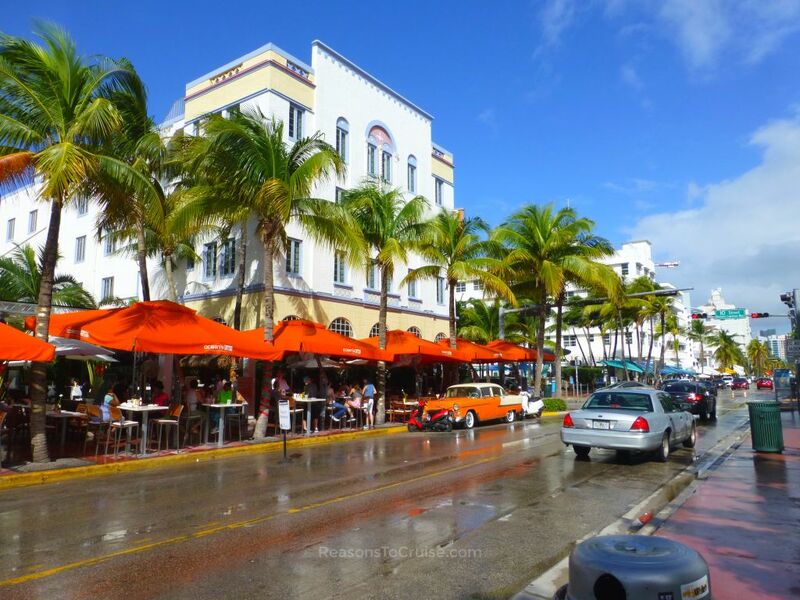 I spent two hours exploring the Art Deco buildings of Ocean Drive in South Beach and the busy street markets at the Lincoln Road Mall. I arrived at Miami International Airport at 2 pm leaving three hours to check-in, pass through security, and head to the gate. The British Airways check-in was the slowest process, taking an hour to snake through the relatively short queue. Security was fairly quick leaving just over an hour at the gate. If you intend to spend time exploring Miami, take a look at the range of available discounts on the main attractions to save a bit of cash. You may find the Miami Attractions Pass or Go Miami Card may be worthwhile. Have you travelled to Miami with children? Do you have any tips to share? Tell me your top tips in a comment below. I’m so glad that I extended my stay when I cruised out of Miami! I had 4 nights in fort lauderdale beforehand and 3 nights in south beach afterwards. I didn’t really plan on cruising during the holiday but it wasn’t really any more expensive than staying in Miami… and it was brilliant. That sounds like a great way to do it.